Could the best chicken dinner in the Capital Region come from inside a plastic box? Every fiber of my being is telling me not to write this story. There are precious few Nature's Place rotisserie chickens in the case at my local Hannaford to begin with. Often I get the last one or two. Sometimes I have to wait around until the next batch comes out of the oven. So if even just a few people decide to make this a regular part of their Friday night supper, I might find myself in the lurch. 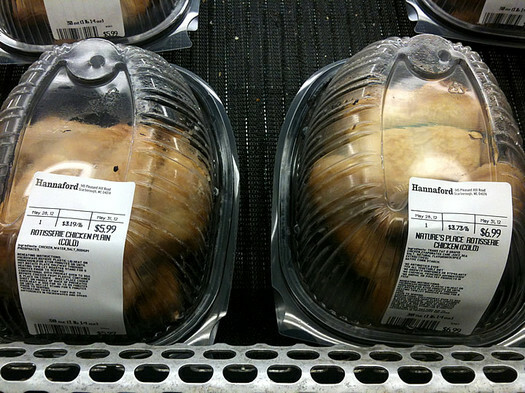 Not all the Hannaford rotisserie chickens are created equal. The Nature's Place birds are special. Occasionally you have to look closely at a label to make sure you are getting the right one. But you can always tell, because the Nature's Place chickens are trussed with a green string. Now, I'll admit that it doesn't look like much sitting in its little plastic prison, especially the ones that are a day old and chilled in the cold case -- but these are actually the very best specimens. It sounds a bit odd, and I don't blame you for being suspicious. However, this chicken exists in the fortuitous intersection of quality, convenience, sustainability, taste and value. 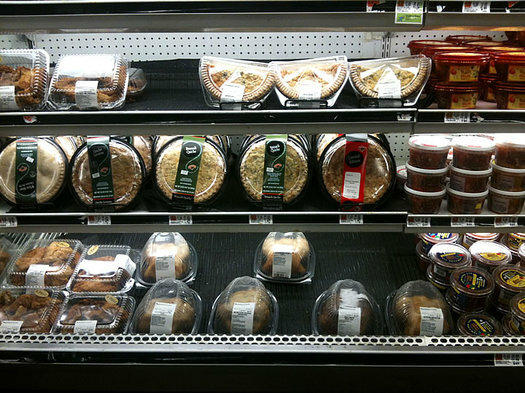 "Naturally raised" is a meaningless claim when it comes to food. Even though many of the practices used to raise conventional chickens might not sound terribly natural, there is nothing from preventing a producer from using that label. My ideal chicken comes from a local farmer. There it lives the life of a chicken, roaming around, pecking in the dirt, eating bugs, and potentially being supplemented with a diet of organic farm-grown grains. I'm on the fence about whether it's slaughtered by hand on the farm in a humane manner or if it is brought to a facility that has the capacity to air chill the birds (instead of dunking the carcass into a vat of treated water). It arrives fresh and not frozen, so that I can slather it with melted butter, salt and pepper. After which I slow roast the chicken at an unconscionably low (and potentially dangerous) temperature until its breast is juicy, the thighs are cooked through, and the skin is cracker crisp. That costs a lot of money and takes a lot of time. It's not for the novice. But for special occasions it is totally worth it. Before you step up to the big leagues, you can practice your chicken carving skills on these really delicious and much less expensive birds. Hannaford says that their Nature's Place chicken is "fed [an] all vegetable diet." The only reason this is good is it provides further assurances that there are "no animal or poultry products in [the] feed." Chickens can be fed cows that were deemed unfit for human consumption. It's kind of gross. Hannaford also says that these chickens were "raised in a way that provides humane living conditions" and were fed "no antibiotics ever." That is pretty great for a supermarket chicken. There is a small catch. And that is, to bring this chicken to the apex of its glory you are going to have to do a very small amount of work after you bring it home. Now this is going to vary just slightly depending on if you bring home the chicken cold or hot. For hot you simply need to put the chicken on a roasting rack, and place it on a high oven rack so that the top of the chicken is just a couple inches away from the heating element. You do this backside up first, and crisp the bottom of the chicken. Then you take it out, turn it around, and do the same thing to the breast side. If you get the chicken from the cold case, you will need to heat it up first before crisping its skin. This is crazy easy. Some will tell you to pat dry the skin, and brush it with a little olive oil first. You can do that if you want, but it's really not necessary. Simply put it uncovered in a 325 degree oven for 25 minutes. Then proceed with the directions above for what to do with a hot chicken. Should you be lucky enough to get your chicken cold, you are likely to find in the bottom of the container a bunch of golden and gelatinous goo. 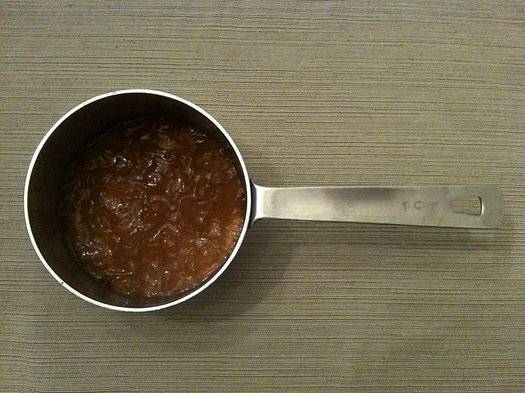 This isn't actually chicken stock, but it can serve a similar function and provide the base for a sauce. Scrape every last morsel of that precious substance into an appropriate pan, boil it with a little water, dry vermouth, and potentially some herbs if you like. Then at the end, whisk in more butter than you think is sensible. Hot chickens come with some of these drippings still in their liquid form, and you can treat these similarly. However I've found on average the cold chickens to have a greater quantity of the stuff. That, along with some quick side vegetable and starch, makes for a quick and simple meal. The other bonus is that when you eat all the meat from the bones, you can wrap up the carcass and throw it in the freezer. Once you've assembled five of them, you are ready to make a batch of genuine chicken stock. Amazingly, this high quality, delicious, tender, juicy, flavorful, and sustainable chicken costs a mere $7.99 hot, $6.99 cold, and on rare occasions can be found cold with a one dollar off coupon on its carton. I just hope that when you start showing up to eat these chickens that Hannaford will start to make more. If they don't, I'm bringing my family over to your house. Great tips on buying the chickens cold, saving money, doing something creative with the goo at the bottom, and saving the carcasses for chicken stok. And my Hannaford is far enough from yours that I'm not going to be cutting into your private supply. If the goo at the bottom isn't chicken stock, what is it?!? I love roast chicken but I don't make it in the Summer. I wouldn't mind letting Hannaford make it for me but I have to know what the ingredients are. Thanks for the great chicken tips -- my family and I have been addicted to these birds for some time now, and this article will definitely improve our experience! I have a chicken in my fridge waiting to be cooked. I've always been a bit skeptical of the chicken in the plastic under the bright lights. However, it would be a welcome shortcut and now I see a tasty one as well! Good idea of roasting the chicken at home- I need crisp chicken skin! I thought supermarket week was last week. Is this article a "leftover"? yuk yuk yuk... Thank you. Please tip your waitress. I still can't believe you'll get chicken in plastic, but not use a microwave for anything. That said, I can vouch for Daniel B. 's Hannaford-chicken-reheating ways. Surprisingly succulent stuff. Especially that vermouth mixture. Damn you for telling others about this chicken. We get one or two a week (we are chicken lovers in our family) when it is too hot to turn on the oven long enough to roast a chicken. We try to only get the "natural" chickens, when they run out we have to get the conventional chicken-- it's too salty and just not as good as the green one. We use any leftovers for flautas or quesadillas. Wish you hadn't spilled the beans. I'll raise my Price Chopper chicken against five of your Hannaford! P.C. 's ready made chickens are something to cluck about. In the summer i serve mine with a fresh salad, and corn on the cob. Winters feast has noodle pudding,and glazed carrots complimenting the bird. 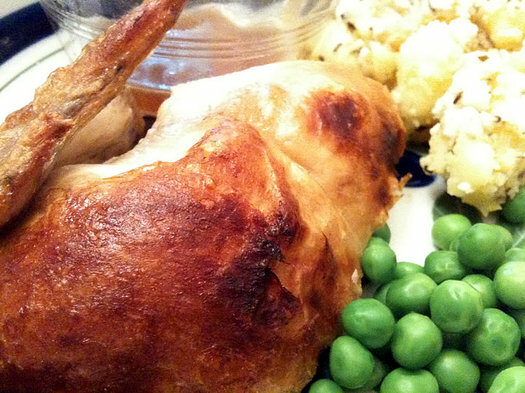 I agree with Daniel's approach to the Nature's Place rotisserie birds - quite tasty indeed. The average rotisserie bird is 2 1/2 to 3 lbs. So why can't you find a 2 1/2 to 3 lb. bird in the fresh butcher case at either Hannaford or PC? I've got a rotisserie attachment for my gas grill, but finding small chickens to roast on it is nearly impossible. 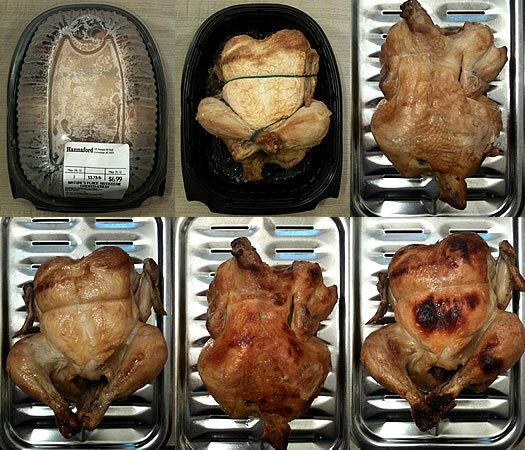 The bigger birds are almost always too fatty to get crispy skin. They taste exactly the same. People think the extra dollar means it tastes better...haha. Purely psychosomatic. Hi, I remember when the Nature's Place rotisserie chickens were trussed with a green string. The one I got tonight is trussed in dark blue. The store said all the other chickens are trussed in orange and the Nature's Place are now trussed in dark blue. Are you aware of this? Trying to find out the truth of it. Daniel, if there aren't any nature's place chickens available in your local Hannaford, it's because I bought them. You shop at the same Hannaford as I do. I know because I see you check-in on yelp. Sorry my friend, but when it comes to tasty chicken, may the best man win. Great article! I call these "microwave chickens" and I skip all the prep-work and sit down with the hot chicken still in the container and proceed to house all the white meat, doggy gets the dark meat and skin. Bite for me...bite for the dog. It's a fabulous, salty feast.